Climbing in Canary Islands -Lanzarote The Canary Islands are seven in total; Teneriffe, Gran Canaria, Furteventura, Lanzarote, La Palma, El Hierro and La Gomerra. Every island is special and has its own unique landscape. 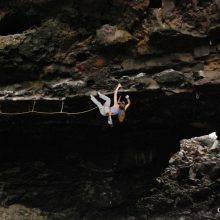 There is climbing on all of the islands, ranging from only bouldering to sport climbing and long traditional routes. You can easily travel between the islands with boat or airplane. What makes the climbing in Lanzarote so spectacular is that almost all the climbs you find, are on steep overhang and roofs with good grip on sharp volcano rock. The actual climbing sectors are to be found deep down in the ground, and not as usual on mountainwalls. The island is mostly flat with only a few old and sandy volcanos skeletons standing around. Nevertheless the climbing is fantastic, here you find technical and powerful routes where you get to use your whole body for finding rests and saving power to finish the demanding roofs. 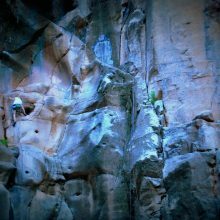 There are many great routes rangin from 6b to 8c+ with a majority in the 6c-7b+ grades. Because of the sharp rock, your skinn will be done before your muscles. 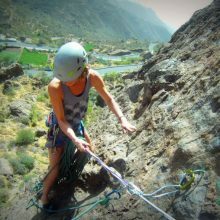 Climbing tejp, durable clothes and long slevs and pants are your best friends for making the best out of the climbing time in Lanzarote. But!!! 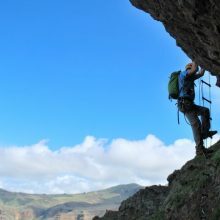 before you start packing your bag and planning a tripp here, it is very important that you take in consideration that climbing in Lanzarote is a sensitive issue. Many of the crags are actually prohibited to climb, so don´t expect to find a guidebook or a lot of information on the internet about approach and locations. 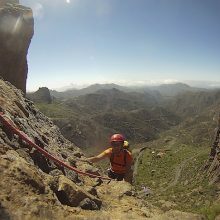 If you want to climb in Lanzarote I would recommend you to either contact us at Grand Climb or find a local climber in Lanzarote that can assist you with access and information.